Nucor Skyline is pleased to give back to our local communities. 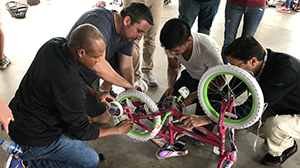 This year, the attendees of our sales meeting built bicycles for the Boys and Girls Clubs of San Antonio. The STARS program focuses on Academic Success, Good Character, Citizenship, and Healthy Lifestyles. Nucor Skyline is pleased to give back to our communities though local charities and organizations.